The residential real estate market (single family, condo, and multifamily) in Cambridge and Somerville in the past 12 months continues to be very strong. Low inventory, continuing low mortgage interest rates and a strong local economy have contributed to an appreciating market. 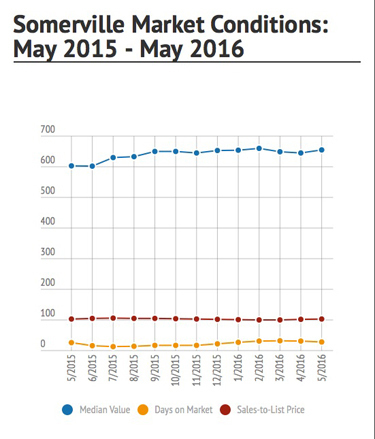 Median value increased <b>23.8%</b> from May 2015 to May 2016. Median value was $626,000 in May 2015 as compared to $775,000 in May 2016. Median value has decreased 6.62% from the peak median value of $830,000 in March 2016. The average number of days on market (DOM) has remained historically low over the past 12 months. It was 26 days in May 2015 as compared to 17 days in May 2016. Sale prices relative to list prices ranged from 102% -107% over the past 12 months. These ratios remain at historic highs. The Cambridge residential market remained in an appreciating cycle for the past 12 months. Demand has outstripped supply resulting in frequent multiple offer scenarios. Winning offers are often cash, well over asking price, and with no contingencies. Values are in thousands. Month to month market data is determined by the previous 3 months of sales. All data from MLS PIN. 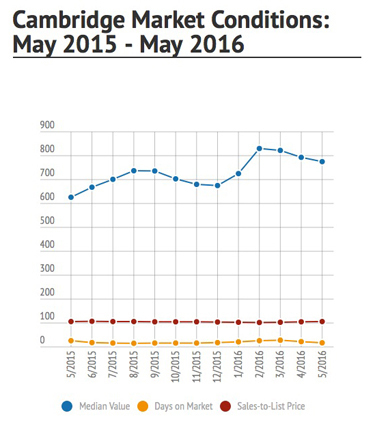 Median value increased 8.62% from May 2015 to May 2016. Median value was $603,000 in May 2015 versus $655,000 in May 2016. As in Cambridge, the average number of days on market (DOM) has remained historically low over the past 12 months. It was 26 days in May 2015 as compared to 28 days in May 2016. Sale prices relative to list prices was 103% in May 2015, increased to 106% in July 2015, declined to 100% in March 2016, then increased to 103% in May 2016. As in Cambridge, the Somerville market has been in an appreciating cycle for the past 12 months. Appreciation in Somerville is strong, but more moderate than Cambridge. We are seeing some over-priced listings staying on the market and needing price changes to sell.